Our custom Web Site Solution will provide you with a Web site following full standards and specifications. Your Web site should serve as a clear gateway to new clients. Equipped with marketing tools and uniquely designed to your firm’s specifications. Custom Web sites offer the most effective way to target prospects online.The possibilities are as endless as your imagination. 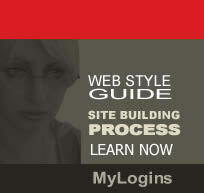 Step 1 - Are you sure a Custom Website is what you need? Before you spend the time and money on a custom site, check out the amazing flexibility in both design and features available to VERNISAGE template Web site page. If it's simply a case of maintaining the 'brand' applied to your paper-based marketing campaigns. - Step 2 - Don't rush into it! If this is your first Web site, don't rush into anything. Consider starting with a standard site while you compile your 'wish list' for the custom site. Move up to a custom site only when you're ready to do so.